I drink too much tea. It is shameful really. Some days I completely forget to drink anything that is not heated, infused and oftentimes soy-milky. But no one can deny that tea, whether black, green, herbal or otherwise; really is something very special. When I was a kid on the farm, my Nan and Pop lived just a few paddocks away. I was always keen to visit Nanny because she celebrated almost every visit with a tea ceremony. An aluminum and bakelite tea pot, Bushells loose leaf scooped into the pot, a small tea strainer, tea cups with saucers. Nan mixed her own powdered milk each morning, so her tea had a very unique flavour. The big draw card was that tea was always served with a selection of her own farm kitchen baking; perhaps raspberry jam sponge, coconut slice and butter biscuits. If it was morning tea of afternoon tea we would be joined by Pop, who would come in from his yard duties of sweeping the concrete paths, the old apple sheds and listening to the cricket on his wireless radio. 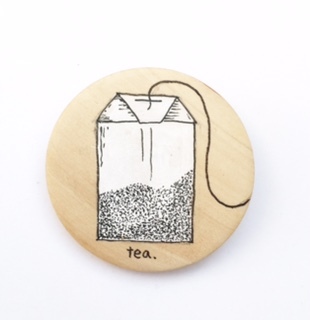 I don't know whether Nan would approve of us using tea bags, but here it is a beautiful original one of a kind, never to be repeated illustrated tea brooch by Hamish and one of the most favourite that we have made because it makes me smile every time.